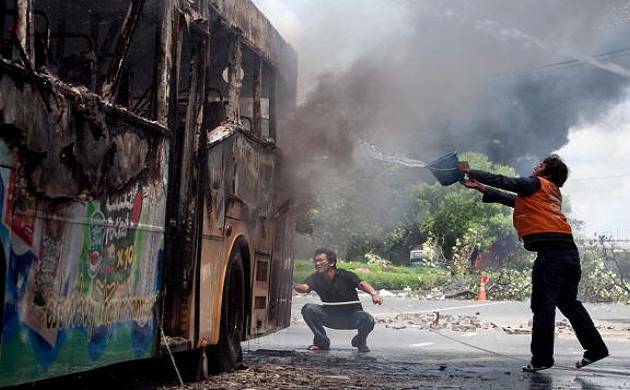 A massive fire erupted at a bus stand in Warehouse area of Jammu city, in which five buses were completely gutted. No casualty has been reported so far. "Five buses have been completely gutted in the massive fire late last night," Kunal Jamwal, Incharge of Police Post Warehouse, said. On getting information about the fire, police shiftedaround 25 buses from the area, he said, adding, fire tenders were pressed into service and the blaze was controlled late in the night. No one was injured in the incident as the place was evacuated, Jamwal said, adding the cause of the fire is being invested.